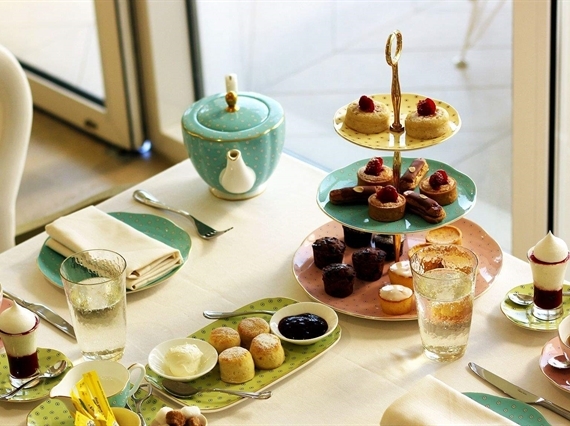 Famed for his modern take of the best of British cuisine, Gary Rhodes and his dedicated team have developed a fabulously traditional take on the most popular of British traditions - afternoon tea. An afternoon at Rhodes W1 will leave you feeling transported to an English countryside setting, as you sit back, relax and sip tea out of the finest Wedgewood bone china, enjoying the enchanting gold and white butterflies and pops of colour throughout the restaurant which evoke a beautiful English garden. Alternately enjoy afternoon tea al fresco and bask in the peaceful ambience of the Rhodes W1 terrace, while the weather still permits. from 2:30 p.m. to 5:00 p.m.
AED 295 per person inclusive of a glass of house Champagne.